There's not a lot of hope for the Brewers in 2016, as the team has put all its hopes onto 2017 and the years ahead with its full-roster rebuild. This week, SI.com is previewing all 30 MLB teams for the 2016 season, counting down to the No. 1 team in the league. At No. 25: the Milwaukee Brewers. You have to squint. Maybe leftfielder Ryan Braun, at 32 and with five years and $105 million left on his contract, will return to MVP form after a few seasons compromised by a PED suspension and injuries to his thumb and his back. Maybe his dinged-up running mate, catcher Jonathan Lucroy, will be healthy, too. Maybe first baseman Chris Carter, signed as a free agent after being non-tendered by the Astros, will hit 37 home runs again, as he did two years ago. Maybe toolsy 6’5” outfielder Domingo Santana, another former Astro—there’s a theme for new general manager David Stearns, formerly Jeff Luhnow’s assistant in Houston—will break out at 23. Maybe centerfield prospect Brett Phillips (another key piece in last July’s trade that sent Carlos Gomez and Mike Fiers to Houston) will arrive ahead of schedule to save the club from the prospect of regular at-bats for Kirk Nieuwenhuis. Maybe defensively gifted, 21-year-old shortstop Orlando Arcia—sixth on MLB.com’s top 100 prospects list, after batting .307 in Double A—will also force his way into the majors early. Maybe Matt Garza will surpass 200 innings for the first time since 2010. Maybe hard-throwing, 26-year-old starters Jimmy Nelson and Wily Peralta will suddenly develop into a credible one-two punch for a rotation that ranked 28th in ERA last year, at 4.79. Maybe. Here is a list of players whom the Brewers have traded since the last day of August in 2014, when they were 73–63 and tied atop the NL Central: reliever Jonathan Broxton, outfielder Khris Davis, Gomez, Fiers, first baseman Adam Lind, outfielder Gerardo Parra, third baseman Aramis Ramirez, closer Francisco Rodriguez and shortstop Jean Segura. You can’t blame them, as a 9–17 September left Milwaukee six games out of even a wild-card spot two years ago, before last season’s disaster. Lucroy wasn’t just the best catcher in baseball in 2014; he was one of the best players in baseball. His 6.2 Wins Above Replacement (FanGraphs version) ranked him eighth among regulars, sandwiched between the Marlins' Giancarlo Stanton and the Indians' Michael Brantley, and he finished fourth in the NL MVP balloting. He paired elite hitting (a .301 average, 13 homers, a league-high 53 doubles) with similar receiving skills behind the plate; he was such a good pitch framer that he could turn a finger-painting hurler into Rembrandt. Last year, though, Lucroy missed a month and a half with to a broken toe suffered in mid-April and then a couple more weeks in September due to a concussion. He finished with a .264 average, seven homers and a .717 OPS, a drop of 120 points from 2014. Catching is a grueling gig, and the 29-year-old Lucroy hasn’t done it in a major league game since last Sept. 8, when he took that fateful foul tip to the mask. But the Brewers need him to return to form and his natural position to have any shot to compete. Realistically, though, they’ll need him to do so in a sustained way in order to reestablish his trade value—which could be extremely high, as he’s due less than $10 million in salary over the next two years and because several contenders (including the Astros, Nationals and Rangers) have clear holes at catcher. A healthy, productive and catching Lucroy is the type of trade chip that could significantly shorten any rebuilding plan. 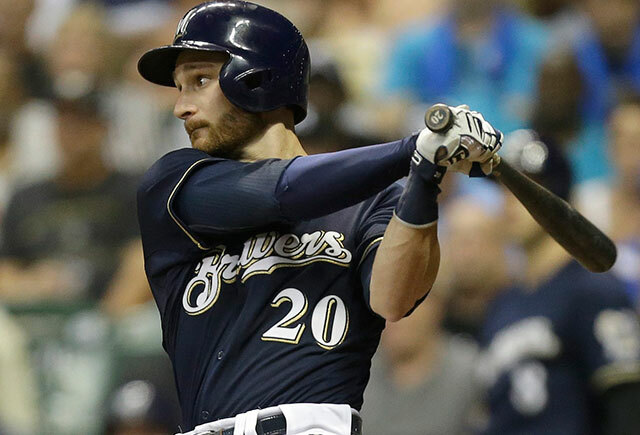 A Lucroy who is limited to playing first base would have much less value, both to the Brewers and to suitors.